Let me start by wishing you all a very Happy Navaratri! May the Goddesses be with you! Navaratri is celebrated with so many different religious and social rituals, isn’t it? I remember in particular the many musical presentations – of varying quality to be sure – that I have listened to in front of golus. So if I celebrate Navartri with a musical presentation in this blog, it seems very appropriate, doesn’t it? This year I shall be featuring the famous Navavarana kritis of Muthuswami Dikshithar. I shall be featuring the performances featured by The Hindu in 2012. As this is the first of the nine posts, I will give you a small introduction to the kritis being featured. The नव आवरण (nava-AvaraNa) or the ‘Nine Enclosures’ kritis are in honour of the Goddess Kamalambika of Tiruvarur. These are arguably the most important sets of compositions by Muthuswami Dikshithar. These kritis are laced with the tantric knowledge of Sri Vidya upasana into which Dikshithar had been initiated by the yogi and tantrik Chidambaranatha. In his youth, he had accompanied the yogi to Kashi and other teerthas and stayed with him for a number of years. The worship of Sri Vidya is a deeply mystical and esoteric form of worship. The Goddess is worshipped in the form of Lalita Tripurasundari (The Beautiful One of the Three Realms). She is represented in the form of a mystical diagram called the Sri Chakra or Sri Yantra where she resides in the centre as a bindu or dot. 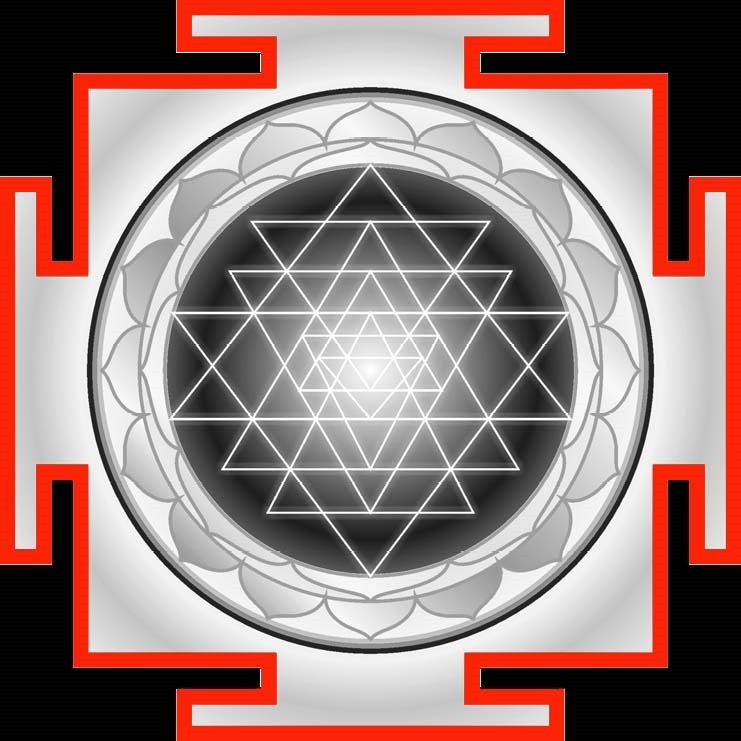 She is enclosed in a series of nine concentric layers formed by squares, lotuses and triangles which are called Avaranas. Each Avarana is guarded by a presiding deity and other attendant deities. Dikshithar’s kritis are in honour of each of these Avaranas. The first Avarana is called Bhupura (earth) and consists of the three outermost lines which are in the form of squares with ‘entrances’. It is also called the त्रैलोक्य मोहन चक्र Trailokya Mohana Chakra (That which enchants the three realms). These lines are guarded by Devis who bestow worshippers with both worldly and spiritual wealth. Our song today is in honour of this Avarana and is set to raga Ananda Bhairavi. It is presented by Vidya Kalyanaraman (starting at 06:31). O Mother (amba) kamalAmbA who resides (nivAsini) in the lotus-city (kamalA-nagara) of the heart (hRt), protect (samrakshatu) me (mAm)! She is the lotus-faced One (abja mukhI) who is worshipped (ArAdhita) by the pure-minded (sumanasa). She is the companion (sakhI) who pleases (priyakara) the mind of Lord Sundareshwara (sundara). She is the happy One (sukhI) who has the knowledge (bOdha) of the Bliss of Brahman (kamalajA=Brahma, Anada=Bliss). She is the lovely parrot(kantA shukhI) who lives in the cage (panjara) of Omkara (tAra). She is the Goddess (IshvarI) of the chakra beginning with (Adi) Tripura. She is the Goddess (IshvarI) of the siddhis beginning with aNimA. She is the deities such as Nitya Kamaleshvari (the deities of this chakra). She is inherent in (vartinI) in the Trailokya Mohana Chakra, the entire earth (kshitipura). She is the manifest (prakaTa) yoginI. She is the slayer (mardinI) of Buffalo-demon (mahisha asura), the enemy (ripu) of the Devas (sura). She has the perception (samvedinI) of the sacred literature (nigama), epics (purAna) etc (Adi). She is the Goddess (IshI) of the three realms (tripura). She is the mother (jananI) of Guruguha (Kartikeya, also signature of composer). She is the One who pleases (ranjani) the destroyer of the three realms (tripura bhanjana). She is the sister (sahOdari) of the enemy (ripu) of Madhu (=Vishnu). She is slender-waisted (talOdari = abdomen (udara) the size of a palm of a hand (tala)). She is the great (mahA) Goddess (IshvarI) Tripurasundari. May the Goddesses be with you too. I am a late comer here. But did the next best thing. Reading all 9 posts and listening to all the compositions at one go. (In the reverse order – 9 to 1!) And that gives me an idea of the work you had to put in. Great idea and well executed. Your modern interpretation of the ‘chakras’ and other concepts is really interesting and illuminating. We all should be thankful to you for this.